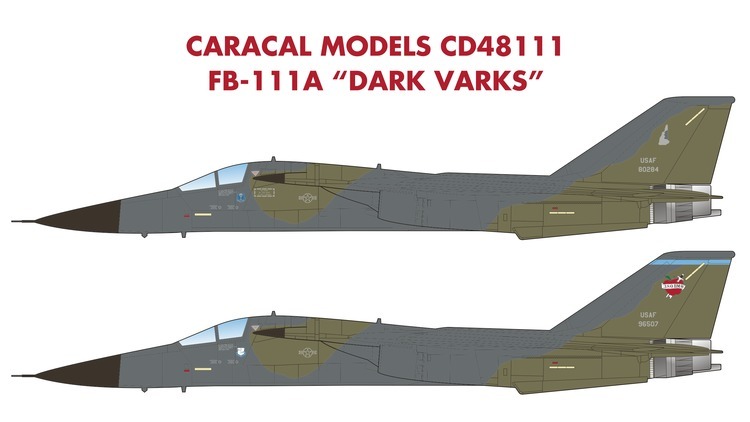 Caracal Models CD48111 - FB-111A "Dark Varks"
This 1/48 scale sheet is our first one for the venerable F-111 series; and it depicts FB-111A strategic bombers in the "Dark Vark" camouflage scheme used mostly during the 1980s. Nine unique aircraft from both units operating the type (380th BW at Plattsburgh AFB and 509th BW at Pease AFB) are featured, each with unique nose / landing gear well door art. We also provide accurate stencilling and supplementary decals for the RAM coverings in the air intakes. Designed to fit both Academy and Hobby Bosss kits. 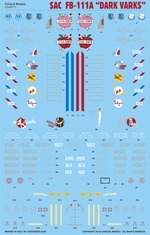 Accurate stencilling, national insignia and RAM intake decals to build any one of the options is included. This sheet was professionally screen printed by Cartograf in Italy.